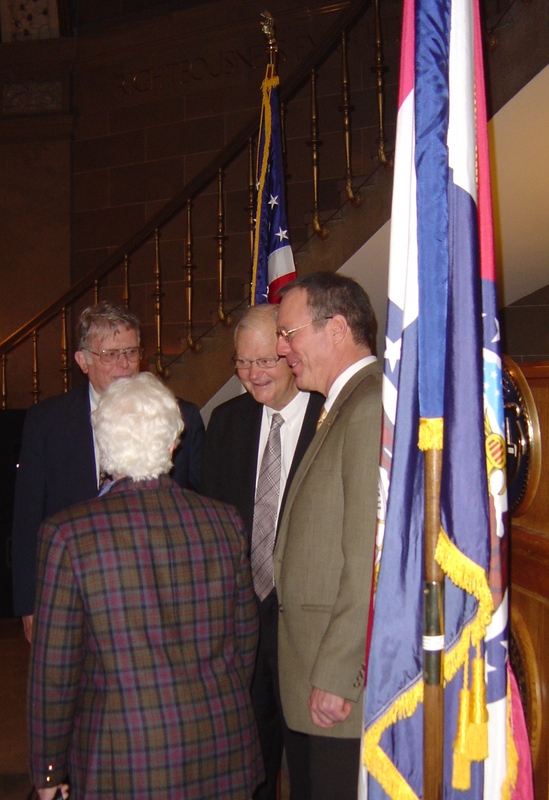 Former West-Central Missouri Congressman Ike Skelton warned of a military stretched too thin and becoming too distant from the public, during a ceremony at the Capitol held by the Mid-Missouri Council of the Navy League. The League and the USS Missouri Commissioning Committee honored Skelton for his years of service to the military, including his chairmanship of the House Armed Services Committee. Skelton gave a brief speech after receiving numerous awards and mementos from the two groups, warning that the wars in the Middle East have forced the Pentagon to use creative deployments, such as sending members of the Navy and Air Force to perform duties normally performed by the Army or Marines. Skelton said his biggest concern is about the growing gap between those in uniform and the taxpayer who supports them. “I am very concerned about the growing gap between those in the military, those who wear the uniform of the United States and the civilian in America,” Skelton stated. Skelton, a Democrat, lost his bid for re-election in the Fourth Congressional District to Republican Vicky Hartzler. The Fourth Congressional District incorporates both Whiteman Air Force Base and Ft. Leonard Wood.